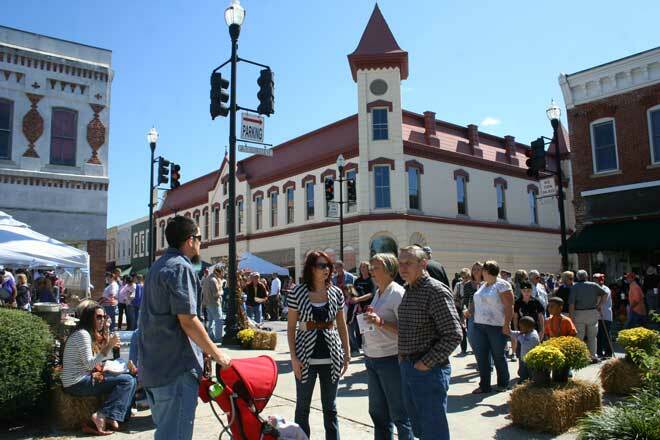 We were delighted when The State newspaper in Columbia said we are one of the reasons to visit Newberry! The article Five reasons to spend a summer Friday evening in Newberry suggested trolling for antiques in the number one spot. 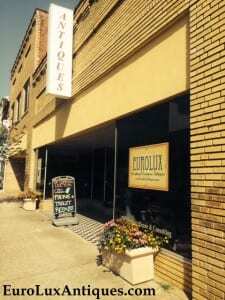 The journalist said: “Head to EuroLux for fine European and Asian furnishings.” Yay! Of course, if you can’t come and see us in person, you can still visit our EuroLuxAntiques.com online gallery. Greg and I have also been doing the speaking circuit. We were recently invited to speak at the South Carolina Municipal Association Annual Meeting of all of the mayors in South Carolina. Our session was called Clicks Supporting Bricks. It was about how even small family-run stores and mom-and-pop merchants like us can harness the power of the Internet to run their businesses. We also spoke to students in the Professional MBA program at the University of South Carolina Moore School of Business about entrepreneurship and what it’s like to own your own business. Dr. Richard Robinson has followed our story for the past 10 years since I wrote the original business plan for EuroLux in his Entrepreneurship class while I was working on my MBA at USC. We have spoken to his students several times throughout the years and I always enjoy encouraging folks to go out and chase their dreams. Greg and I were at the University’s Columbia site, speaking to groups simultaneously and interactively in the Charlotte, Greenville and Charleston campuses. Some students who were on the road with their jobs in various spots around the country also tuned in live. While it was very interesting to use the technology to reach so many folks in different locations, I definitely have to say it was a bit unnerving speaking via technology rather than being directly in front of an audience. I didn’t realize how much I depend on the non-verbal cues from an audience to feel comfortable while speaking. I guess that even though our EuroLux business depends on web technology and Greg and I are very familiar with that, even we still have to get used to other forms of new technology! 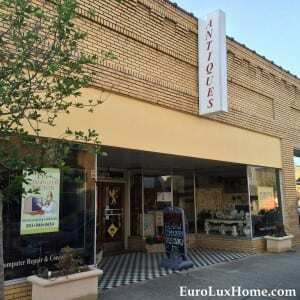 This entry was posted in News and tagged Antique Furniture in Newberry, Antiques in Newberry, EuroLux Antiques, how to buy antiques on the internet, Newberry Antiques, Newberry South Carolina, Sell antiques on July 24, 2014 by admin. April was National Decorating Month and I hope that our blog posts helped inspire ideas for your home! Let’s revisit some of our favorite antiques and decor posts from April. Gray popped up as a hot decor trend for 2014, so in National Decorating Month I wrote a post on Gray Decor in the bedroom & living room. Gray is so adaptable. It works well with natural materials in a rustic country setting and in sophisticated city rooms. 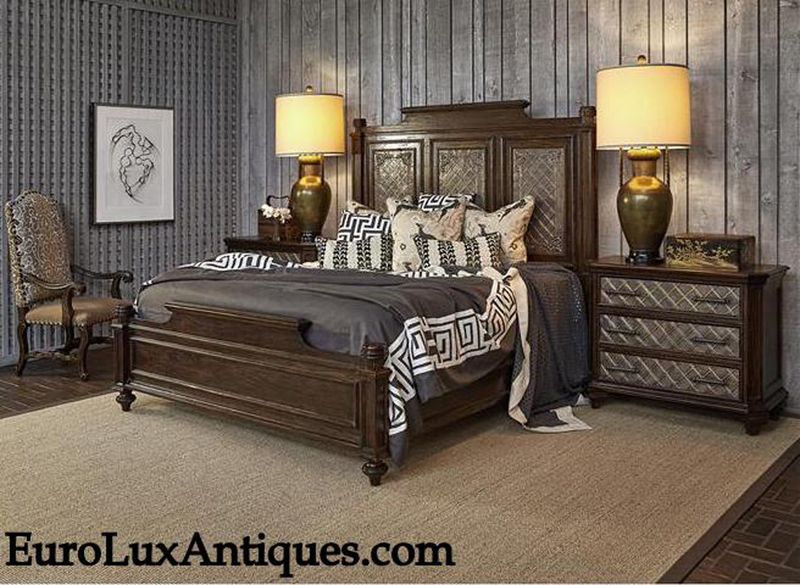 It’s great with exotic or heavy textures too, like this Castilian themed Ambella Home bedroom. 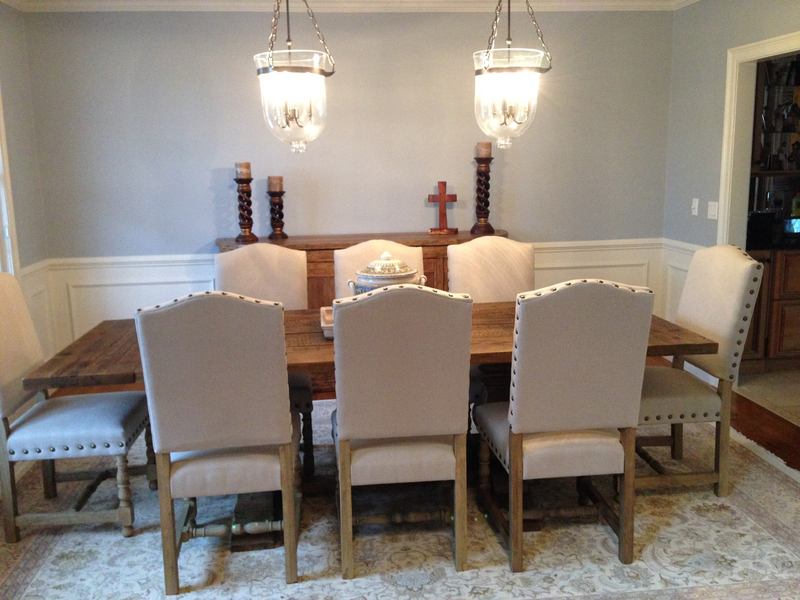 Our Madrid dining chairs client spotlight about Heidi’s chic dining room also emphasized the beauty of neutral colors. Heidi has a set of our linen-upholstered Spanish style chairs in her dining room. The pale gray paint on the walls and the light tones of the carpet and chairs give a fresh twist to the room’s traditional Spanish Mission style influence. Heidi’s dining room is perfectly timeless but also perfectly NOW! For a splash of color, you don’t always need a big decorating project. I think it keeps the spirit of National Decorating Month to use smaller accents and creative touches to ring the changes in your home. 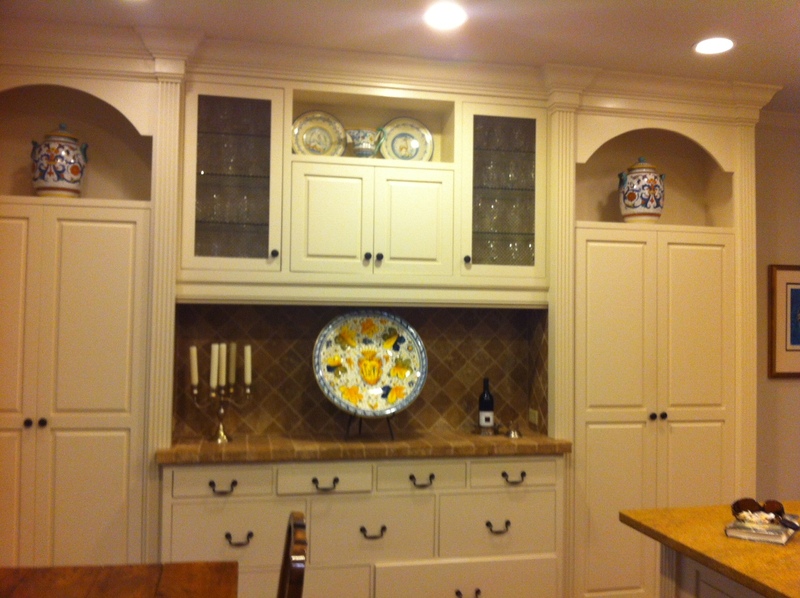 For example, our client Bunny sent us this photo of her kitchen adorned with old Italian Deruta ceramics she bought from us. See more in our post on the sunny Mediterranean style of hand-painted Vintage Deruta Ceramics. During National Decorating Month, Greg and I worked hard at spring cleaning and sorting some of our older stock. The good news for you is that we’ve slashed prices by about 40% (or more!) on some beautiful antiques and vintage pieces that are still waiting for a good home. 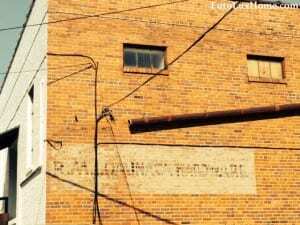 See some of our favorite bargains in our Spring Cleaning Antiques Deals post. 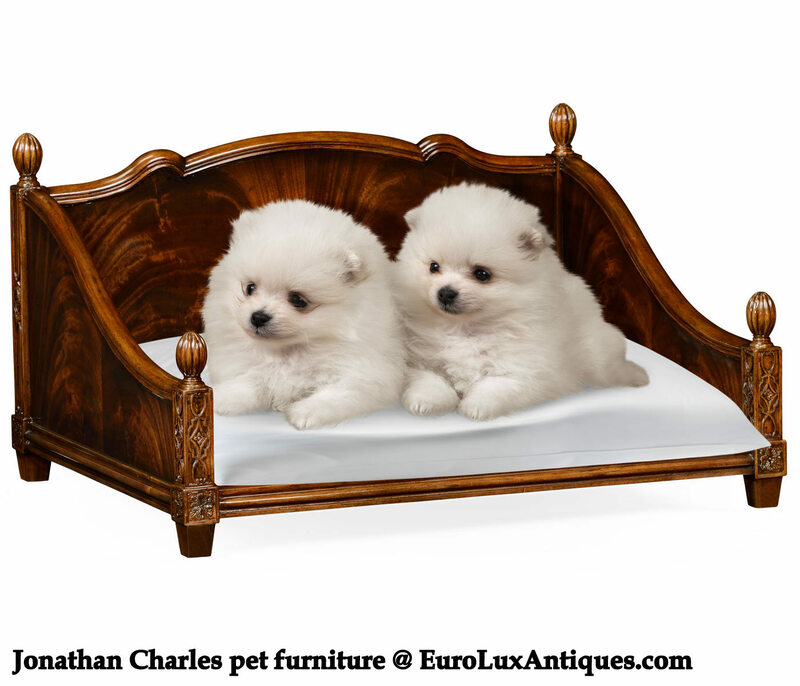 Or visit EuroLuxAntiques.com to browse for deals on antique furniture, lighting, clocks, ceramics, and other smaller items. Finally, we celebrate our 10th anniversary in 2014 and we’re having great fun remembering highlights from our early years. If you want to know what NOT to do when a slab of marble on an Art Deco sideboard breaks just before a major antiques show, read this post on our First Atlantique Antique Show. We had a Laurel and Hardy moment involving the marble, too much glue, and a glass-topped hotel table. It’s funny to look back on, even if it wasn’t so funny at the time! Thanks for spending National Decorating Month with us. We’ll share more ideas and inspiration about antiques and home decor in May. This entry was posted in Antique Furniture, Home Design Ideas, News and tagged Ambella Home, Antique Furniture, color trends, EuroLux Antiques, gray decor, home decor, home decor accessories, interior decor, interior design, neutral colors on April 30, 2014 by admin. We’re celebrating our 10th anniversary here at EuroLux Antiques and today I’m remembering one of our “Laurel and Hardy moments” at our first Atlantique antique show. It is always fun to look back – to celebrate our successes and laugh at our follies – on our long journey that brought us to where we are today. As I mentioned last month, we started the business by traveling to antique shows before we actually opened our Gallery. Our very first antique show in Atlanta was a disaster, but we certainly learned from our mistakes, and our next show in Charlotte was smooth sailing. We did a few more shows in Atlanta and Charlotte before we decided to venture up north to the great big Atlantique antique show in Atlantic City, NJ, in March 2005. 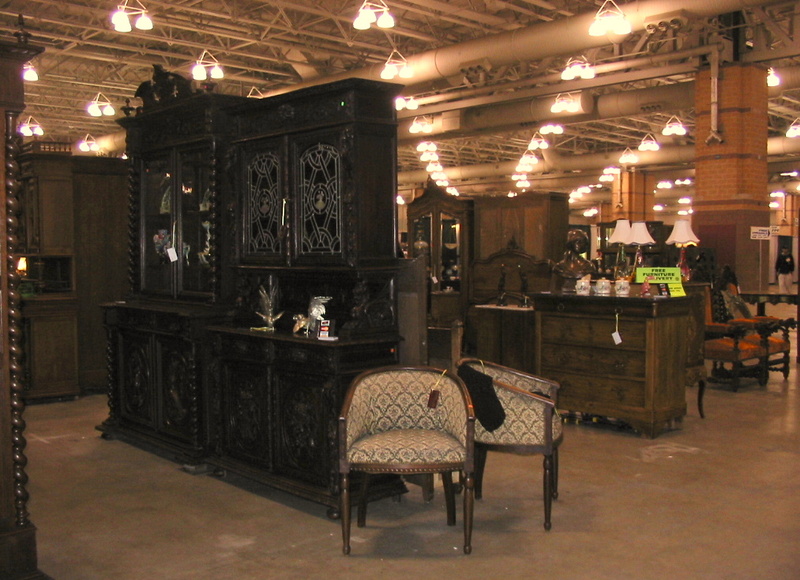 It was New Jersey’s largest and longest running indoor antique show with more than 500 vendors. 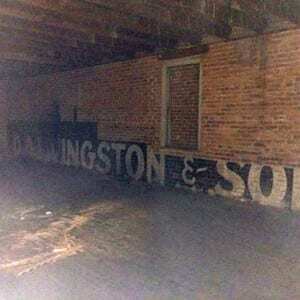 It was known as “the big one” among antique dealers that we met at the time and everyone said we just had to do it. We listened to the stories that old-timers like to tell newbies about wealthy customers sweeping in to the Atlantique antique show and buying up everything in a dealer’s booth. It sounded wonderful to us! So Greg and I bought a 28-foot trailer and loaded it full of antique furniture and away we went, heading north on I-95. We arrived at the Atlantic City Convention Center and were impressed at how well they coordinated the load-in of more than 500 dealers – the sheer volume of antique inventory stretched several football fields! While we were unloading a beautiful Art Deco Sideboard with three big pieces of marble, one of the pieces of marble tumbled out of its packaging and broke in half. Oh no! Always resourceful, we went out to Lowe’s and bought supplies to repair the marble overnight in our hotel room. It was a very clean break, so we were able to glue and clamp it and set it aside to dry. We debated whether it was better to break the glass top or just abandon the marble – neither option was ideal. What to do, what to do? The Atlantique antique show was starting soon! Greg decided to take a flathead screwdriver and see if he could gently pry it up without damaging either the glass top or the marble. Fingers and toes crossed and hold your breath! And suddenly, after a few minutes of careful wiggling, we heard a “ssssllllluuuurrrppp” – Greg had released the marble from the glass! What relief! We grabbed the marble and headed off the show, grateful at our dumb luck. In the end, the Atlantique antique show went well and we did sell quite a few pieces and met some interesting folks too. But nine years later, we still laugh about how we glued that marble to that hotel room table! 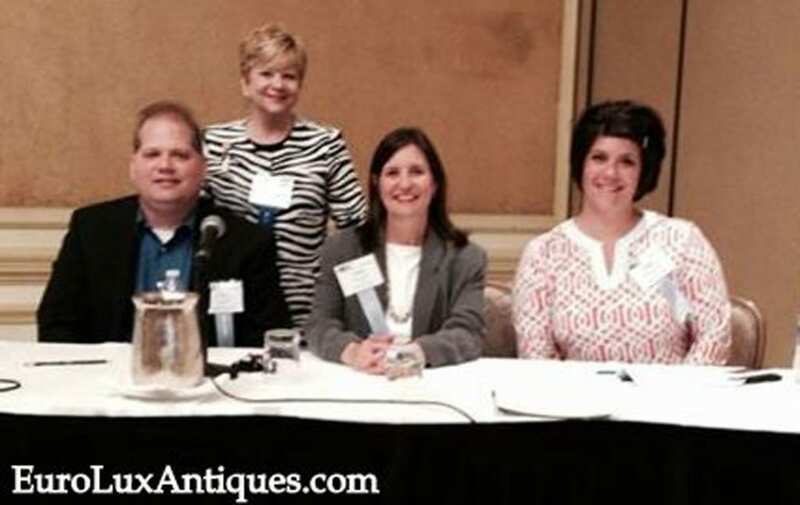 Do you have any great stories to share of antique shows you attended? Tell us about them in the space below! 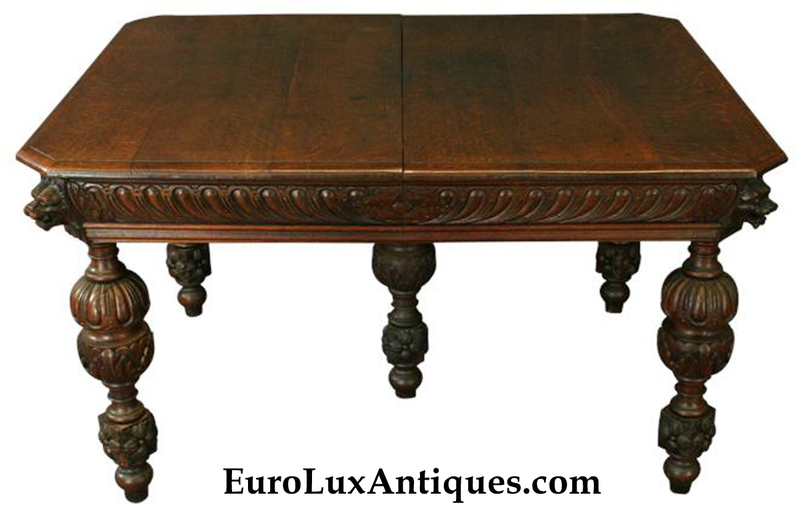 This entry was posted in News and tagged antique French furniture, Antique Furniture, antiques, Antiques Market, Antiques Shopping, EuroLux Antiques, EuroLux Antiques Anniversary on April 25, 2014 by admin. Before I share our favorite antiques and decor posts from the last month, don’t forget that you can still get 10% off everything at EuroLuxAntiques.com (plus our always-free shipping) through March 31, 2014. Just enter the coupon code: AntiqueTrail at checkout. 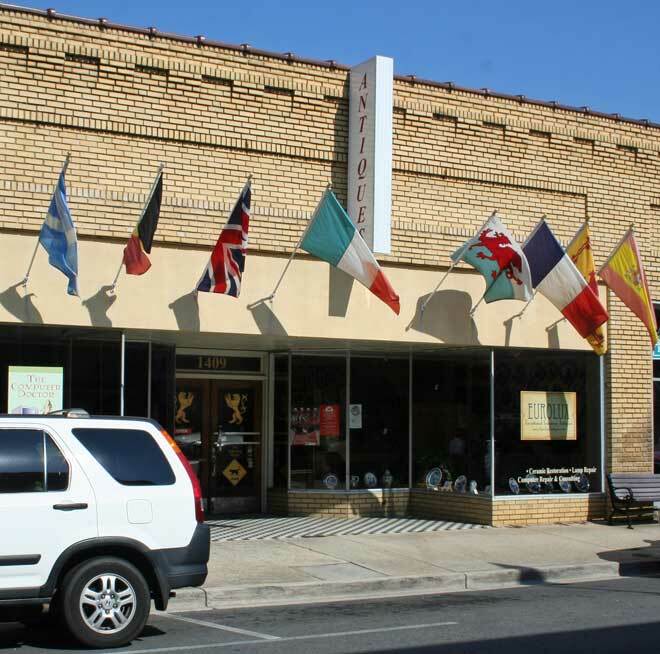 Or mention the Antique Trail if you come to our Newberry, SC, gallery. 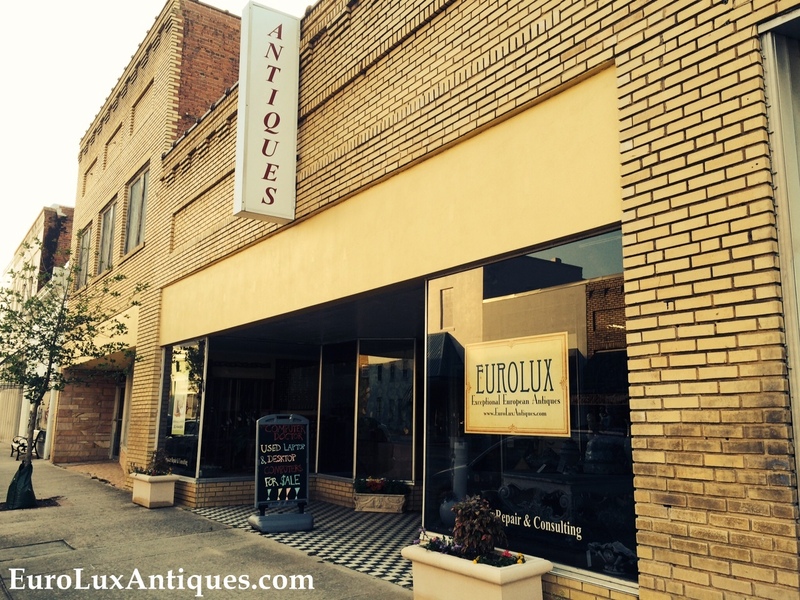 As I said in my Antique Trail post, the March discount on all our antiques and decor accents, from furniture to lighting, is to celebrate the fact that EuroLux Antiques is on the South Carolina Antique Trail. Our store is on the online trail map and on maps at visitor centers and antique shows. Let’s revisit our other favorite antiques and decor posts from March. In our series of client spotlights, Aly and Bruce in Oregon shared photos of their home with the unusual Late Qing Dynasty Chinese cabinet they bought from us. We also heard the romantic story behind the purchase. 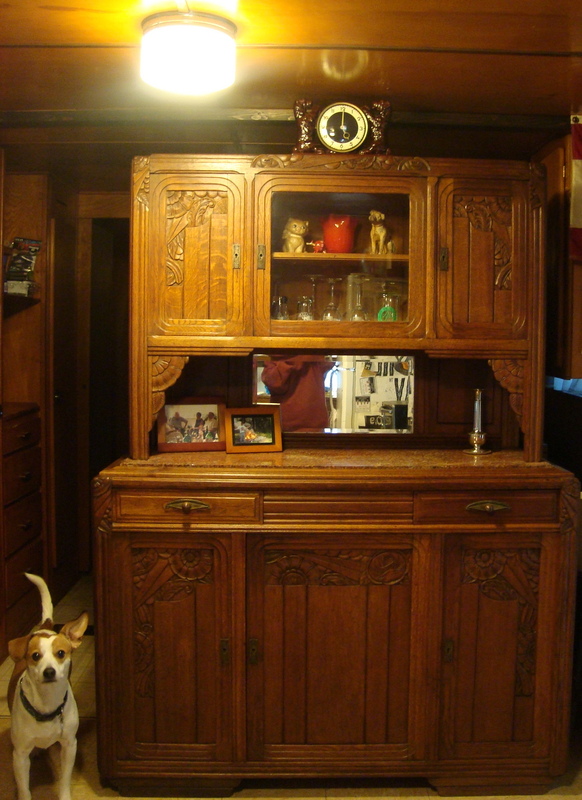 Aly found the antique Chinese cabinet on our website and showed it to Bruce. He decided to surprise her and ordered it on the sly! The antique elm display cabinet from the Shanxi Province dates to 1900 and it looks wonderful in Aly and Bruce’s home. “The piece is extraordinarily beautiful and fits perfectly right where I planned to put it,” said Aly. 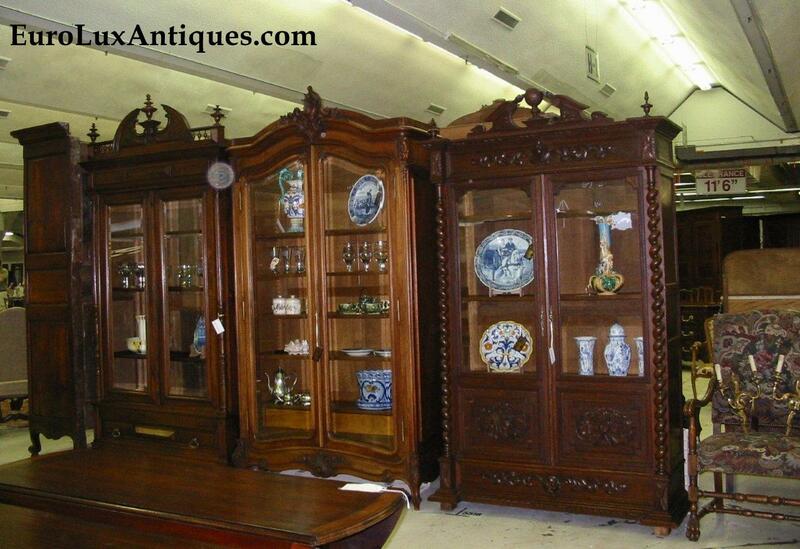 See more in our Antique Chinese Cabinet spotlight post. 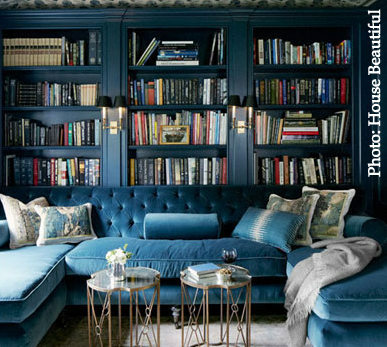 The latest interior design trends for 2014 say that blue decor is tipped for the top this year. The bolder and more intense, the better! Deep navy and saturated turquoise are especially in vogue. See some inspiring ways to add blue antiques and decor into your home in my True Blue Decor post. As usual in the weeks approaching Easter, we are getting a lot of inquiries from people about our antique religious treasures. Customers are also preparing for spring Confirmations and First Communions. 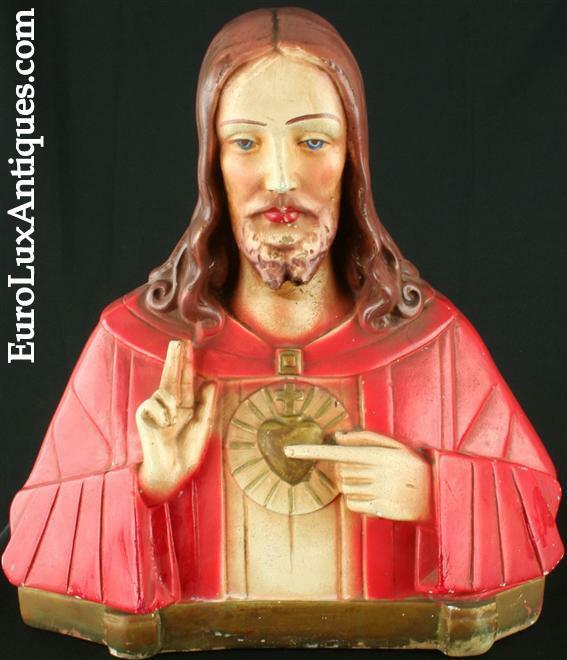 My post on antique religious treasures shows why the devotional wear on objects from standing crosses to holy water fonts and Jesus Christ and Madonna statues makes them even more beautiful. Finally, as Greg and I are celebrating our 10th anniversary of EuroLux Antiques this year, we’ve been remembering our early years in the business. We’ve had so much fun but we can’t help but look back and laugh at some of our mistakes too. For example, we really didn’t know what to expect when we arrived at our first antique show in Atlanta, GA, in 2004. Rolling up in the wee hours of the morning in our rented U-Haul truck packed tight with antiques and decor accents, we soon discovered that we were just not quick enough at unpacking and reassembling our antique furniture to keep up with the frenzied buyers running from dealer to dealer. It was like some crazy TV game show! Read the full antique show story and how we ended up late at night, hours after the show ended, just us and a long-suffering security guard waiting for us to get ourselves out of there! 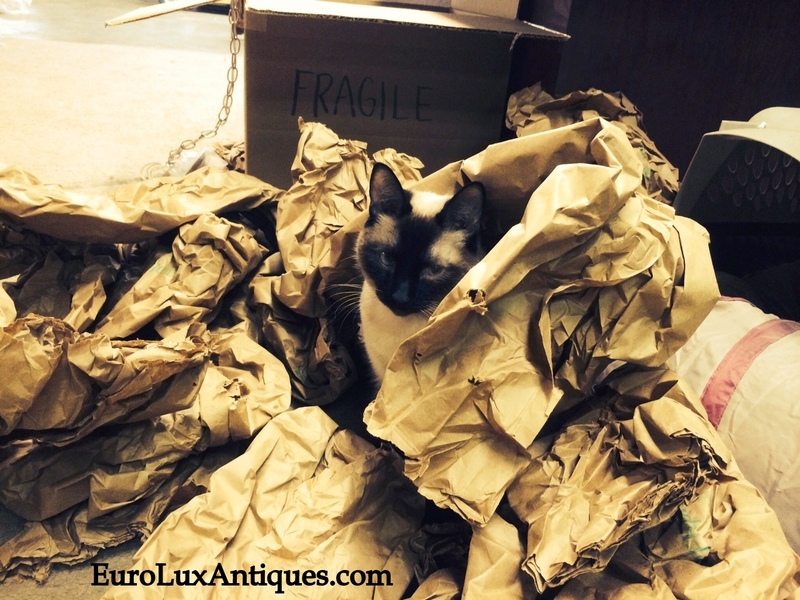 I can just imagine him sighing with relief when we finally exited after midnight: “EuroLux has left the building!”You can see all of our March blog posts at this link, and I look forward to sharing more about antiques and decor with you as we head into April. This entry was posted in Antique Furniture, News and tagged Antique Furniture, Antique Religious object, Chinese Antique Furniture, EuroLux Antiques, home decor, home decor accessories, interior decor, interior design on March 30, 2014 by admin. 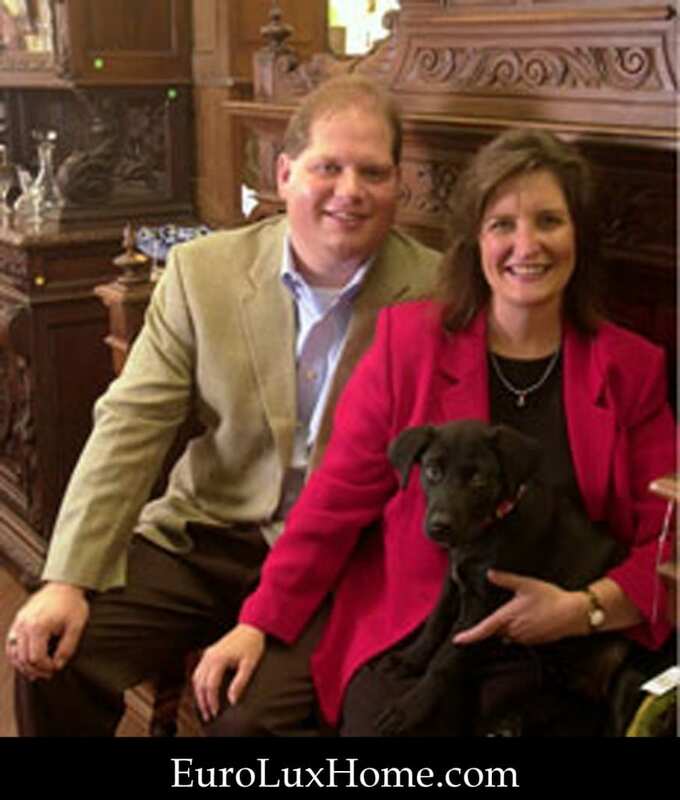 As we mentioned in our 10 Years of European Antique Furniture blog post last month, Greg and I are celebrating our 10th anniversary at EuroLux Antiques this year. It is hard to believe so many years have flown by! We’ve had so much fun over the years, and we can’t help but look back and laugh at some of our mistakes too. We thought you might enjoy chuckling at some of our follies along the way. After we launched EuroLux Antiques and brought in our first container of amazing antique and vintage furniture from France and Belgium, we started out selling at antique shows. In the summer of 2004, our very first antique show was the Scott Antique Market in Atlanta, Georgia. What a bunch of green beans we were! We arrived in the wee hours of the morning at our designated spot with our rented U-Haul truck slam full. Remember how I mentioned in the last post that we had to rebuild all of the antique furniture out of about a million pieces after our container arrived from Europe, and that we really weren’t very good at it yet? Well, we had the brilliant idea that if we took all the pieces apart again, we could pack more on the truck. 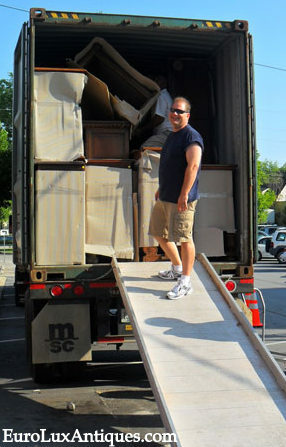 But we didn’t realize that most of the potential buyers would be standing there while we unloaded the truck! We discovered that frenzied interior designers who are running from one truck to the next don’t come back to see you hours later, after you’ve figured out how to put everything together again. There we were with our piles of pieces, watching as the other dealers around us sold armoire after armoire. I swear they were rolling their eyes at our mess. One of our armoires stayed in bits through the whole weekend of the antique show because we couldn’t figure out how to put it back together! I will say the booth looked great though. John had designed the space ahead of time to show where each piece would go. I spent hours putting out box after box of decorative items, known as “smalls” in antique lingo. John, Kathy, Greg and I all had matching shirts with EuroLux Antiques embroidered logos too. While we did sell a piece or two that weekend, it wasn’t the blow-out for which we had hoped. This meant that the only way everything was going to fit back in our U-Haul truck was to take it all apart again. Of course, we had taken our time over the week before the show to strategically pack the truck one piece at a time. We hadn’t considered that we’d only have a couple hours to load all of it back on the truck and clear out of the building at the end of the antique show. All of the other dealers, shaking their heads at our “newbie” mistakes, were long gone by the time we finally got it all loaded again. The poor security guard had to wait until after midnight for us to get our mess together and finally get out of the building. I wish we’d had Minkey there to help pack up from our first antique show. We needed a packing wizard cat and he loves digging in! So although our first antique show wasn’t a smashing success, at least we had done it! We picked ourselves up and learned from our mistakes. Our next show, a month later, was the International Collectibles and Antiques Show at the Metrolina Expo in Charlotte, North Carolina. We had a great show and sold a bunch of furniture. We were on our way and so excited about it. And then came the Atlantique show in Atlantic City, New Jersey, but that is a story for another blog post! 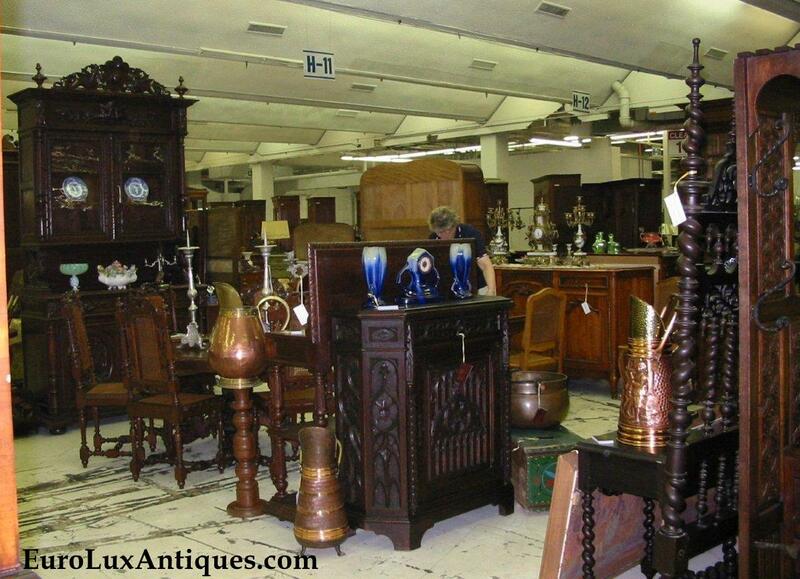 Do you like to go to antique shows in your neck of the woods? Tell us about your favorite antique show in the comments below! 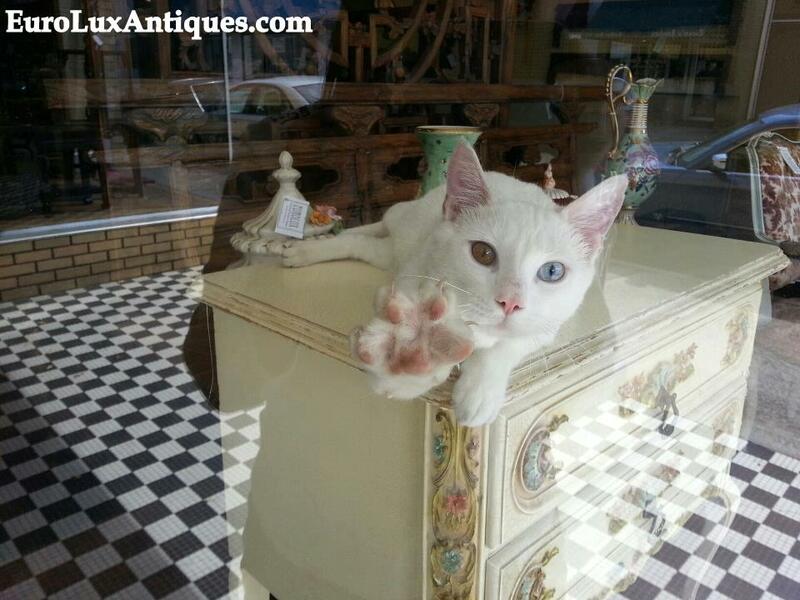 This entry was posted in News and tagged antique French furniture, Antique Furniture, antiques, Antiques Market, Antiques Shopping, Cats & Dogs, EuroLux Antiques, EuroLux Antiques Anniversary on March 28, 2014 by admin. Best of January 2014: Romantic Decor, Rococo, Art Deco, and More! Our January blog posts covered subjects from romantic decor to fancy pet furniture for the furry members of the family, to a client who loves Art Deco furniture. We’ve had a wonderful start to the new year and hope you have too! Let’s revisit some of our favorite posts from the first month of what we hope will be a beautiful 2014. 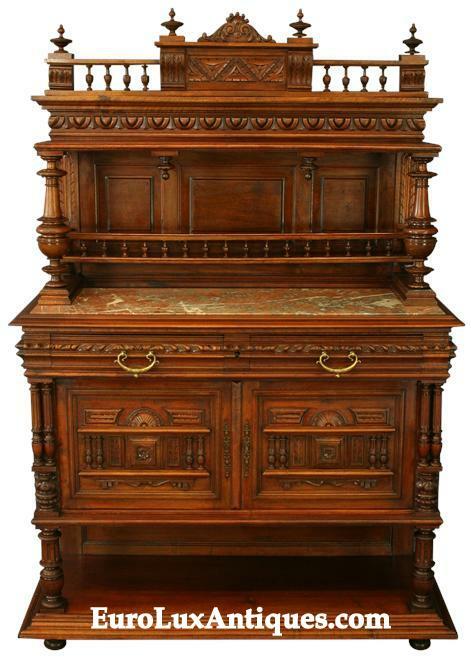 We started by looking back at our top 12 antiques and decor blog posts of 2013. We’re lucky that many clients send photos of the antique furniture or home decor accents they’ve bought from us, showing the pieces in their new home. 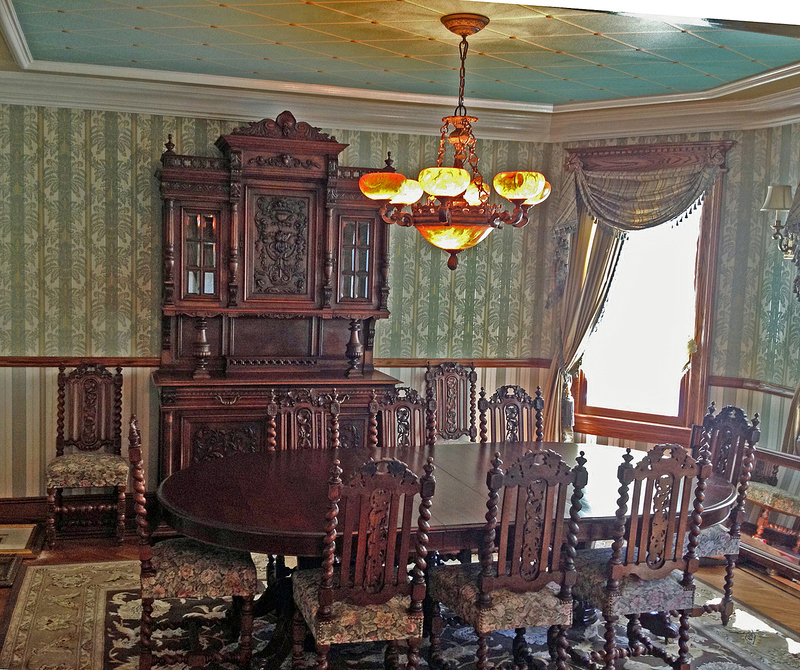 (Like this gorgeous Victorian restoration dining room shared by our client Sal S. in New York.) Those client spotlights are always popular, but other top posts of 2013 included home decor inspirations, travel ideas for antiques lovers, and tips on caring for antiques. Then we looked forward to the opening of the Johnny Cash Boyhood Home Museum in Dyess, Arkansas in 2014 – especially because the museum bought this antique table from EuroLuxAntiques.com! 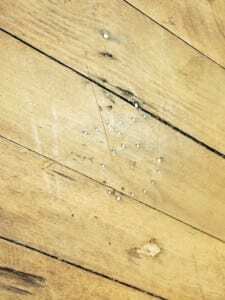 The heavily-carved 1890 table is just like one the Cash family had in their home during Johnny Cash’s childhood, according to the music legend’s siblings. We started getting in the mood for Valentine’s Day by talking about romantic bedroom decor. You could fall in love with many of the design ideas in that post to create romantic decor in other rooms too. Talking of romantic decor, it’s hard to beat Rococo furniture and home accents to add a very pretty note to a room. 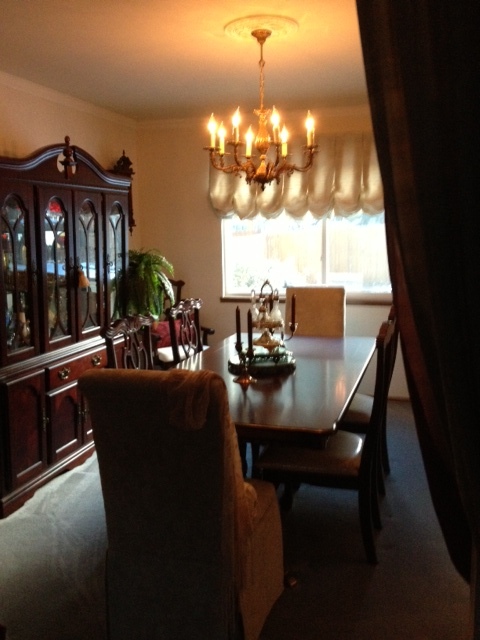 Our client Gail L. in Colorado proved the point in our spotlight on the vintage rococo chandelier in her dining room. The photos in that post show that Gail has created a beautiful and welcoming space. I love the way she creates a slightly theatrical mood with what looks like a heavy curtain draped across the entrance to the dining room. It’s so inviting, don’t we all want to peek behind that curtain? Betty bought this Art Deco buffet from us for her cool 1958 home. She later added the Art Deco clock flanked by two dogs that you see on top of the buffet. (Betty’s real-life pooch obviously approves!) The post on Betty’s Art Deco decor shows the clock in close-up and tells you more about this dear client and another clock she bought from us too. As dogs have starred in two photos in this post so far (they always steal the spotlight, don’t they?) 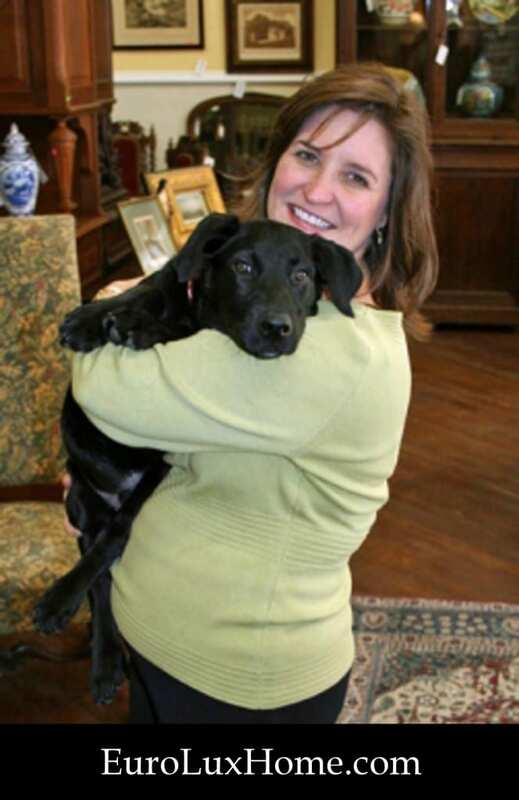 we might as well end this month’s round-up with the antique style pet furniture I found for your dogs and cats. 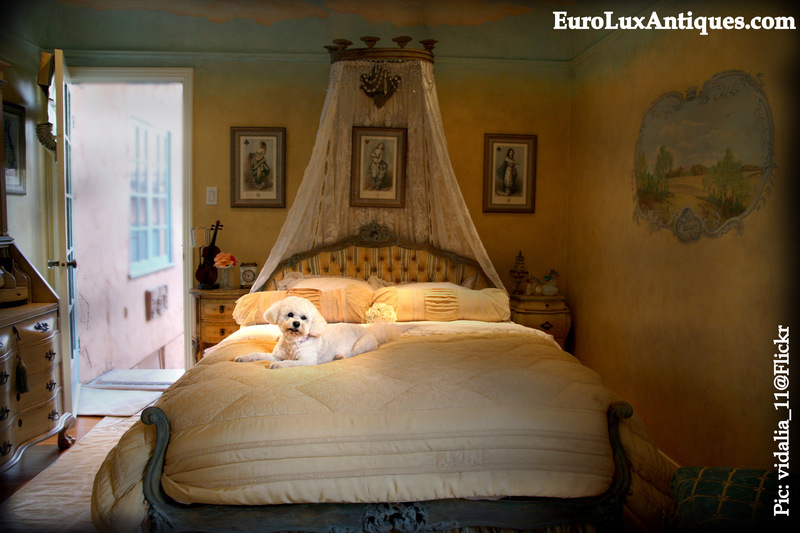 Whether your taste is for Renaissance style, Louis XVl romantic decor, Arts & Crafts or Mid-Century Modern, you can bet I’ve sniffed out matching furniture for your four-legged friends! Most are from specialist pet furniture retailers, but we’ve got a few new pieces of pet furniture on the horizon too. In our January Beauty at Home bookshelf we shared three new books that certainly help put the romance into your decor, whilst our travel piece on Biltmore House and Gardens might provide inspiration for a romantic weekend away. With that, it’s farewell to January but if you would like me to write on any home decor or antique furniture subjects in February… I always take requests! Tell us in the comments box below. 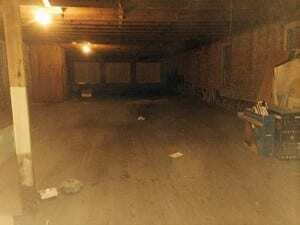 This entry was posted in Antique Furniture, Home Design Ideas, News and tagged Antique Furniture, antiques, design ideas, design inspiration, EuroLux Antiques, home decor accessories, interior decor, interior design, living with antiques, romantic, romantic decor on January 29, 2014 by admin.